Sounds: Panning, what values do what? The documentation suggests there was once a slider for panning from left to right. Which makes a lot of sense. I've tried -100 and 100, and they don't seem to make any difference. It used to be a slider, but now it’s a number. They must’ve forgotten to update the descriptions. If you read what pan does, it changes which speaker plays the sound. iPads only have 1 speaker really, so this only works for external speakers or headsets. I know what Peter Pan does, it's right there in my question. And I'm using an iPad Pro with four speakers, two on each side. Plus headphones. No changes in either scenario. @Aidan-Oxley My question is this: what values should I be using to get full right, and full left? @Deeeds I have used panning before and it worked, but I just tried it with my iPad Pro and AirPods and it isn’t working. I’m guessing it’s a bug. Also, @Murtaza would it be possible for changing the pitch to have a switch for whether or not it changes the speed too? @iTap-Development Agreed: Pitch change without speed change. And speed change without pitch change. The single best feature of youtube. On panning, glad I'm not going insane. Nothing I tried got it working. Thought it was me. I'm a huge fan of panning sounds. @Deeeds Wow, I never knew there was an iPad with more that one speaker! I’m gonna play with this too now, I have some headsets and speakers to try this on. @Deeeds Ok I just tried it, normal iPad speakers no effect (understandable since only one speaker anyway). External speakers no effect, then I tested them with another random game and it seems that with at least these particular speakers, when playing sound from iPad only one speaker actually works. Tried it with headset, it worked and the scale was between -100 to 100. -100 played full sound left speaker, 0 played full sound through both, 100 played through right speaker. @Murtaza will panning work on iPad Pro speakers? Being on iPad Pro shouldn’t make a difference regarding pan since it’s a software adjustment not hardware. I’m thinking this is a bug introduced with ios11 and how it handles audio. Because I don’t think we made any audio changes. @Murtaza I just tested in garage band and panning has effect on iPad Pro there. @iTap-Development Does hyperPad sound panning work on your iPad Pro though? @Aidan-Oxley no it doesn’t… so maybe it is something they will have to support? Although, it wasn’t working even with AirPods. So maybe when they fix it it will work on Pro. 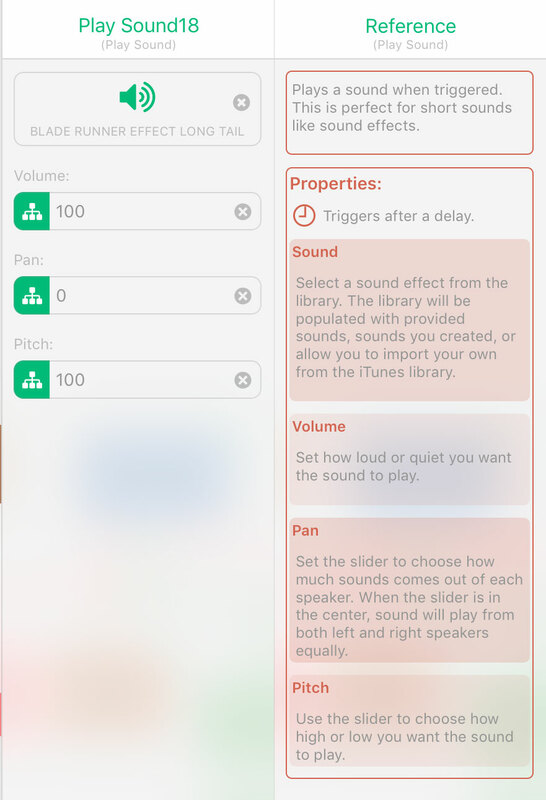 The audio engine can only pan Mono sounds, not stereo sounds. When it's playing a stereo sound it ignores panning values -> completely. With a mono sound, as (I think it was Aidan) said, 100 is full right, -100 is full left. Works on iPad Pro, headphones, everything. Furthermore, it's polyphonically instancing each play of the same sound. Meaning it lets each instance of a playing a sound finish, even if you initiate another playing of the same sound. Not sure how many sounds it will play at once before it gives up, probably varies from CPU to CPU. @Deeeds so garage band is mono sound? @iTap-Development No, probably not. More modern sound engines are capable of panning stereo sounds in all sorts of fun and interesting ways. Old sound engines are not. And I'd bet that OpenAL is what's being used in hyperPad, probably an old version, without Stereo sample panning facilities. The other thing that's gotta be considered, in regards to Garage Band, many of its sounds aren't just samples, but are synthesised in various ways, wherein the limits of samples goes right out the window. A stereo sample (.wav) is already panned by the producer. Some of the sound is set to come out the left, some to the right. Does panning diminish the sound from one side of the sample, or steer and add sound from one side to the other side? Or, really ugly, blend left and right as if it's a mono recording and then split on demand. Early sound engines didn't bother making this choice, or providing these choices for the user to decide from. Quite infamously, this problem existed in Unity for a long time, just as it does in hyperPad, wherein panning simply wouldn't do anything if handed a stereo sample. I had forgotten about this as I've avoided using Unity for quite some time. If that’s the case I would agree an audio engine upgrade would be good. And they're very nice people, too. Truly passionate and committed to their art and craft. Here's a secret... We're actually switching the audio engine :). We're going to start by swapping over existing functionality, then overtime add the other cool features that audiokit enables.